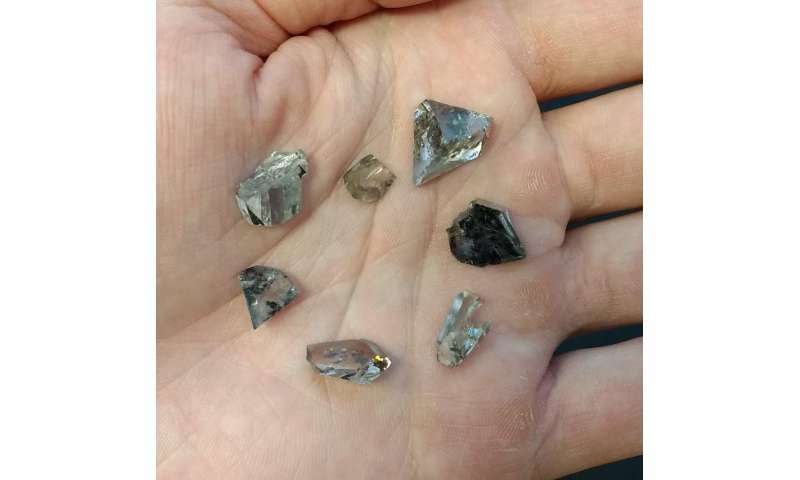 Assortment of diamond offcuts used in this study. The largest is 9.6 carats. 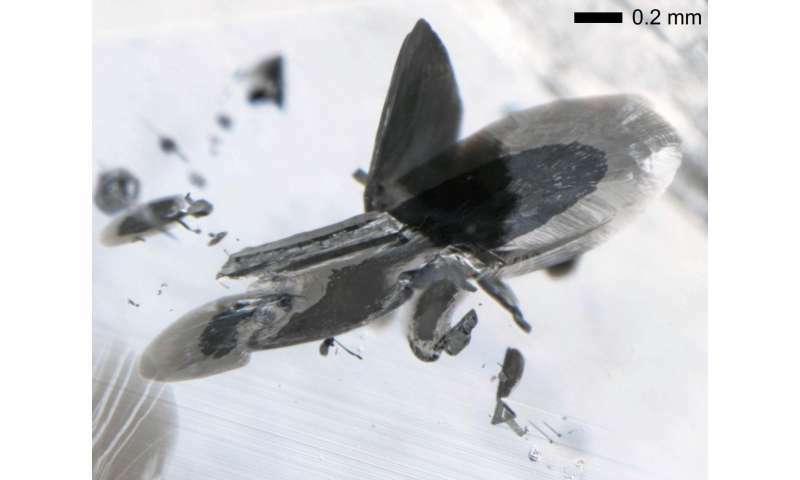 These diamonds could be analyzed by destructive means (polishing to expose inclusions) whereas many other diamonds studied were polished gemstones that were only borrowed and studied non-destructively. Credit: Evan Smith. New research from a team including Carnegie's Steven Shirey and Jianhua Wang explains how the world's biggest and most-valuable diamonds formed—from metallic liquid deep inside Earth's mantle. The findings are published in Science. 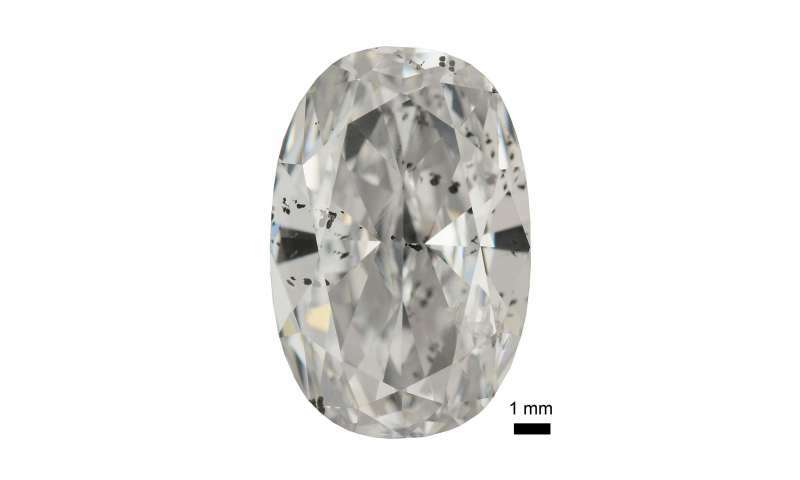 The research team, led by Evan Smith of the Gemological Institute of America, studied large gem diamonds like the world-famous Cullinan or Lesotho Promise by examining their so-called "offcuts," which are the pieces left over after the gem's facets are cut for maximum sparkle. They determined that these diamonds sometimes have tiny metallic grains trapped inside them that are made up of a mixture of metallic iron and nickel, along with carbon, sulfur, methane, and hydrogen. These inclusions indicate that the diamonds formed, like all diamonds, in the Earth's mantle, but they did so under conditions in which they were saturated by liquid metal. As unlikely as it sounds, their research shows that pure carbon crystalized from this pool of liquid metal in order to form the large gem diamonds. "The existence of this metal mixture has broad implications for our understanding of deep Earth processes," Smith said. Diamonds form deep in the Earth's mantle and shoot to the surface in minor volcanic eruptions of magma. Impurities contained inside diamonds can teach geologists about deep Earth chemistry under the pressure, temperature, and chemical conditions in which they were formed. Diamonds, once formed, have a unique ability to protect and shield any minerals contained inside their crystal structures, thereby giving scientists a special, protected sample of the mantle mineralogy and a glimpse at conditions miles beneath the planet's surface. Most diamonds form at depths around 90-150 miles under the continents. But so-called "superdeep" diamonds form much deeper—at depths below 240 miles, where the mantle rocks are known to be mobile due to convection. From the team's work, we now understand for the first time that large gem diamonds are a group of superdeep diamonds, according to analysis of tiny samples of silicate that were also found inside the studied diamonds. These tiny silicate inclusions are also associated with the metal. So what do these tiny samples of metal, along with their associated methane and hydrogen, tell scientists about the deep mantle? It tells them about oxygen availability in different parts of the mantle. Near the surface, the mantle chemistry is more oxidized, which scientists can tell from the presence of carbon in the form of carbon dioxide in magmas erupted in volcanoes (among other indications). But deeper down, according to the team's findings, some regions of the mantle are the opposite of oxidized, or reduced, which is what allows the iron-nickel liquid metal to form there. "The fact that reduced regions can be found in the Earth's mantle has been theoretically predicted, but never before confirmed with actual samples" Shirey explained. "This result provides a direct link between diamond formation and deep mantle conditions, addressing a key goal of the Deep Carbon Observatory," said DCO Executive Director and Carnegie scientist Robert Hazen. "The fact that it was made possible by a hugely successful collaboration between our Diamonds and Mantle Geodynamics of Carbon group and the Gemological Institute of America is also very exciting, highlighting the importance of academic connections with industry and their important role in providing postdoctoral funding and the key specimens for this research." Maybe deep in the mantle there are huuuge deposits of hydrogen and methane that we can use as fuel. Imagine a hydrogen economy driven by deep mantle drilling at depths of 300-400 km. Though I'm not sure that can be done at the temperatures and pressures down there; but then the material may be pretty solid there. If we had the ability to drill down to 300-400 km, why wouldn't we just use geothermal power?